Science author Simon Singh reveals the highly nerdy layer beneath the longest-running sitcom on TV. Simon Singh may not sound like your average fan of The Simpsons. He has a Ph.D. in particle physics from Cambridge and made an award-winning documentary about Fermat’s Last Theorem. Let’s be frank: He’s a math geek. But then, so are a surprisingly large number of the show’s writers. You may not have realized it, but as Singh shows in his new book, The Simpsons and Their Mathematical Secrets, a seemingly endless supply of mathematical jokes and references are crammed into each Simpsons episode. “There are lots of mathematicians on the Simpson’s [writing team]…and they still have a great affection towards numbers and geometry,” says Singh in this week’s interview on the Inquiring Minds podcast (listen below). …or for any other equation with the same structure, but whole number exponents greater than two. Fermat famously (or rather, infamously) scribbled in the margin of a notebook that he had found a mathematical proof demonstrating this impossibility but that didn’t have the room to write it down. Homer Simpson’s brain is not very large (something the Simpsons has proven through X-ray). Nonetheless, Bart and Lisa’s famously dense dad proceeds to write down an apparent solution to Fermat’s last theorem, alongside some other high-level concepts. And if you whip out your calculator and do the math for one of the equations below (3,98712 + 4,36512 = 4,47212), you will find—spookily—that Homer has, apparently, bested Fermat. At first, Singh thought that the mathematical joke was a one-off—a nod from one of the writers, David X. Cohen, who has a BA in physics from Harvard and an MS in computer science from the University of California-Berkeley. But after a bit of research, Singh discovered a close connection between math and The Simpsons. It’s not just Homer who displays his mathematical prowess on the show: None of the major Simpsons characters is exempted from these, er, calculated jokes. Consider for instance a 2010 Simpsons episode titled “MoneyBart,” in which Lisa needs to add extracurricular activities to her résumé, and so decides to coach Bart’s Little League baseball team to diversify her portfolio. Taking the scientific approach, she immerses herself into sabermetrics, the use of complicated statistics to make managerial decisions. At first, her strategies transform Bart’s team from losers to winners, but during one critical at bat, Bart eschews Lisa’s advice to avoid swinging at anything…and wins the game with a fluke home run. But at the state championship, Lisa needs to bring Bart back on the team, as one of her players falls victim to a juice overdose. Once again, he’s faced with the choice of following her instructions or acting on his gut. This time, though, his instinctual response costs the team the game. So what draws math geeks to the seemingly frivolous world of TV comedic writing in the first place? Singh argues that the, er, correlation between The Simpsons and math is no accident. Rather, it’s a harmonious and natural relationship in many ways. For one thing, animation these days requires fairly advanced programming skills, with knowledge of trigonometry, geometry, and calculus. “There is indeed a lot of mathematics behind the scenes,” opined Pixar computer scientist Tony DeRose in a recent talk at the Mathematical Association of America. So it makes sense for today’s hi-tech animators to have degrees in physics, computer science and math. But what about comedy writers? Singh reports that one of the mathematicians on the Simpsons writing team, J. Stewart Burns, draws a parallel between puzzles, which represent the very essence of math, and jokes. “Both have carefully constructed setups, both rely on a surprise twist, and both effectively have punch lines. Indeed, the best puzzles and jokes make you think and smile at the moment of realization,” Singh writes. So we know what you’re wondering: Did Homer really best Fermat in “The Wizard of Evergreen Terrace,” finding a solution to the equation that the mathematician proved had no solution? “The way you resolve this problem,” Singh continues, “is that your phone calculator is not accurate enough to see the error. 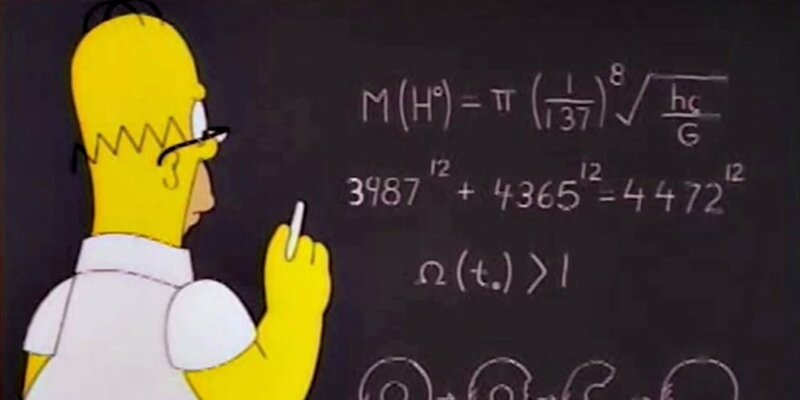 Homer discovered what’s known as a ‘near-miss solution'”—it turns out that simpler calculators don’t calculate out to enough decimal places to show that the equation doesn’t work after all. “I think it’s a lovely little joke about how there shouldn’t be a solution, but Homer found a solution,” Singh says. And therein lies one of the most compelling aspects of the longest running sitcom in TV history: the many jokes, references, and gags that the animators and writers insert into nearly every frame. One viewing is never enough. This episode of Inquiring Minds, a podcast hosted by best-selling author Chris Mooney and neuroscientist and musician Indre Viskontas, also features a discussion of some of the science behind Thanksgiving: why thankfulness is good for us, and what kinds of food safety issues you should know about when it comes to Thanksgiving leftovers.